RM Biltrite™ Flexgard® SBR Rubber is a copolymer of styrene and butadiene and has properties similar to natural rubber. Compared to natural rubber, SBR has superior processability, heat aging, and abrasion resistance but inferior elongation, hot tear strength, resilience and tensile strength. SBR has excellent mechanical properties, low compression set, and high resilience. It also has excellent dynamic and rebound properties and exhibits good resistance to acids, brake fluids, moisture, alkalis and salts. SBR may be substituted for natural rubber in certain applications, offering significant cost savings. Not recommended for use in proximity to oils and hydrocarbons. 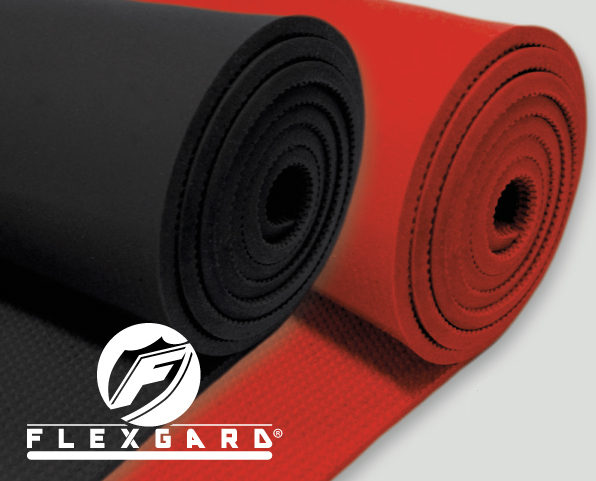 An economical red or black sheet can be used in low pressure applications with no oil resistance requirements.